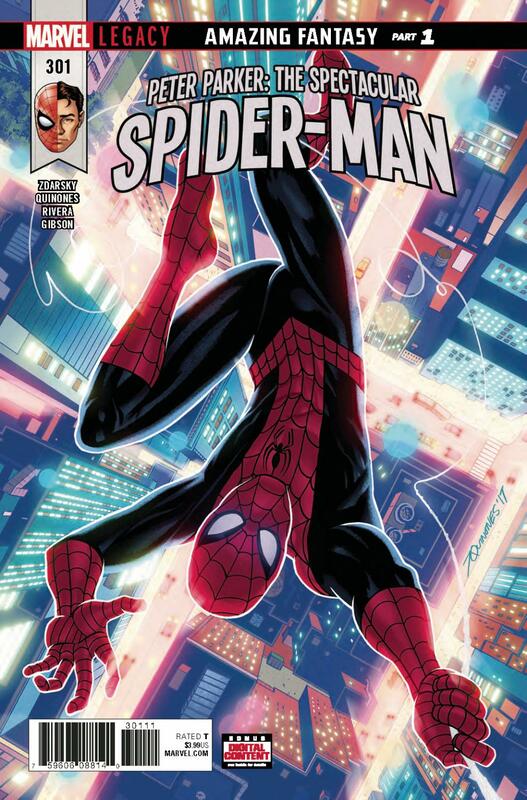 I picked up Peter Parker: the Spectacular Spider-Man #1 last year with hope that it might scratch the itch that Dan Slott’s Amazing Spider-Man had been unable to reach for so long. Initially, I wasn’t too keen on Chip Zdarsky’s new series. The first issue did manage to grab my attention but by the next, I felt that his sense of humor was more belonging in a Deadpool book from a few years ago. However, I’d heard that the series got really good around issue five, so I’m excited to be sharing my thoughts on #301 to see what merit the rumor has. No spoilers. I’m not really sure what I’ve jumped into here. I suppose that the series’ jump to legacy numbering would have been a better time for someone out of the loop to get back into things. Nonetheless, there’s time travel shenanigans afoot. It sets the stage for Peter to reflect on his former self while we look at the writing that drove him and laugh at how much it’s changed. Yes, Peter, you did talk to yourself a lot. Jameson also gets time to think again about how serious his actions against Spider-Man have been. We’ve seen that he knows that adult Peter is Spider-Man, but when he’s reminded that Peter was a child when he started his super hero career, it’s seems like something even we the readers hadn’t considered. He did try to ruin a child’s life. Not aware that he was only fifteen, but still. This issue gives Jonah room in order to remind us that he doesn’t hate Spider-Man mindlessly. He hated him for logical reasons, but regrets them now. Man, would I have loved to see J.K. Simmons get this kind of screen time in a Spider-Man movie. My only complaint as far as this issue’s script is that the time travel shenanigans bring all the cliché time travel conversations you’d expect. Granted, the past characters are reacting how any person would, but it’s a shame that the phrasing couldn’t have been a bit more original. Joe Quinones and Joe River put forth some solid work. It doesn’t blow my socks off but I do appreciate the subtle touches that distinguish the younger characters from their future selves. Both dialogue and action set the stage for iconic Spider-Man poses that make it hard for me not to enjoy what I’m seeing. Being a trip to the past, this issue has a few classic Spider-Man villians appearing too, so I think longtime fans such as myself will find a lot to enjoy on the visual front. Expressions are exaggerated in a way that’s actually pretty funny and relatable; Jameson making a double chin as he pats himself on the back gave me a kick because I feel like I know so many people who do that but I never see it in any form of story telling. Colorist Jordan Gibson keeps shadows surprisingly consistent in placement. I do think that some rooms seemed a little too dark. An office with two people in it in the middle of the day should probably be more well lit. Since Comixology is currently having a big Marvel sale, I think I’m going to take advantage of it to catch myself up to speed. The writing does indeed seem to have improved since last I read, and I must admit I do want to see Peter reveal his identity to Jonah, rather than just hear about it. This arc is off to a good start with threads that are just weird and intriguing enough to keep me going, and as a long time fan of the wall-crawler, this is pretty fun to see first hand as well. If you’ve been off the radar like me, check this one out. Just be prepared to chug through some past/future tense mix ups.